[GETTYSBURG; GEN. JOHN M. SCHOFIELD]. 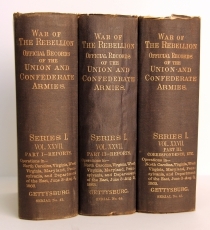 Books, 3 Volumes – The War of the Rebellion: Gettysburg Official Records, devoted to the Battle of Gettysburg. Owned by Union General John M. Schofield (with his stamp in first volume). John McAllister Schofield (1831-1906) graduated from West Point in 1853, seventh in his class. He served in the Third Seminole War (1852-1853) and then taught philosophy at West Point and physics at Washington University in St. Louis. 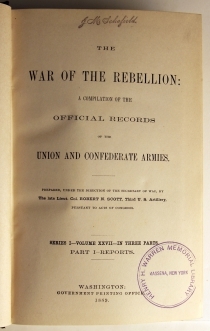 During the Civil War, he was General Nathaniel Lyon’s chief of staff. He received the Medal of Honor for heroism early in the war. He then became Brigadier General of the Missouri militia and later Commander of the Army of the Ohio under William T. Sherman. He accompanied Sherman on his march to Atlanta, and was promoted to Brigadier General of the regular army for actions during the campaign. After the war, President Andrew Johnson named Schofield a confidential agent for the State Department. He then traveled to France to negotiate with Napoleon III over the removal of French forces from Mexico. Johnson then appointed him acting Secretary of War. An able administrator, he held various command posts throughout the 1870s. During that time, he recommended establishing Pearl Harbor, Hawaii, as a military base and was the Superintendant of West Point from 1876 to 1881. In 1888, he succeeded Philip Sheridan as Commanding General of the Army, and his tenure in the post saw better rations, pay, and facilities for soldiers, a professionalized officer corps, examinations for promotion, and improved relations between the Secretary of War’s office and the Army general staff.